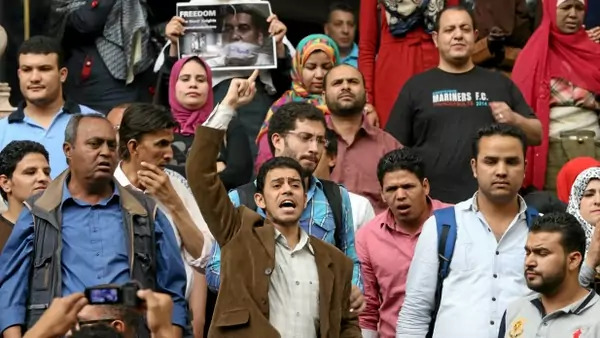 Journalists and activists protest against the restriction of press freedom and to demand the release of detained journalists, in front of the Press Syndicate in Cairo, Egypt (Mohamed Abd El Ghany/Reuters). Theotime Chabre explores the complexities of Kurdish linguistic diversity, explaining how limits in communication across the Kurdish nation can be both a hindrance and an opportunity. Wael Haddara contemplates the long-term impact of the murder of Giulio Regeni on Egypt’s repressive complacency. Naseem Tarawnah argues that Jordan’s cancellation of the Lebanese band Mashrou’ Leila’s concert exposes the country’s lack of cultural pluralism.